Although currently no medication to cure or halt the progression of dementia exists, there are non-medical therapies that can be highly beneficial to people with dementia. We recently spoke to Katharine, who is a complementary therapist from Kilbarchan in Renfrewshire, and started her journey in this field 4 years ago. Before she decided to follow her dreams and become a complementary therapist, Katharine worked in construction and started her own animal feed shop. She is currently studying towards a degree in Integrated Healthcare from the University of Highlands and Island, and says ‘I didn’t ever think I’d come this far. You just learn and learn …. You just think it’s massage. You don’t realise how powerful it is’. Katharine has opened her own clinic Revive Therapies in December 2018. 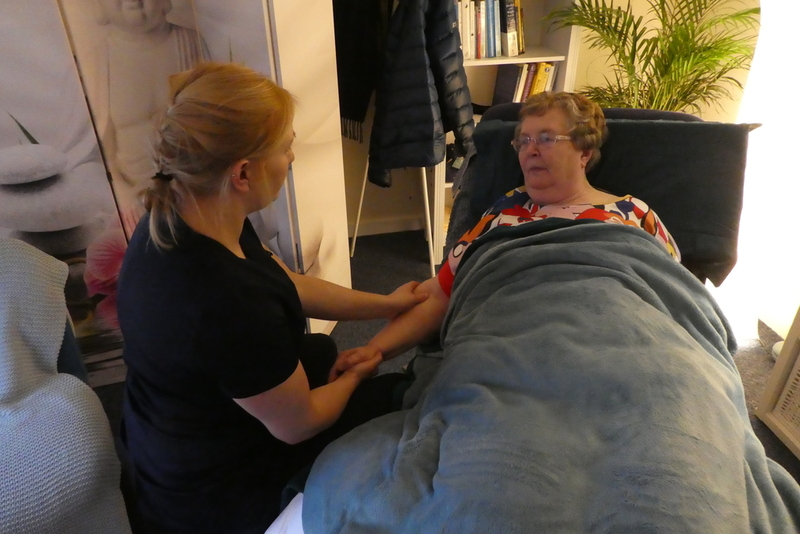 She has a special interest in dementia and in her first blog she shares some insights into how massage therapy can benefit people affected by dementia. In my early years of training as a therapist I had a wonderful experience supporting a lady who was in the later stages of dementia. Dementia was an area in which I never thought I would be able to make a difference as a complementary therapist. How can you benefit a disease of the brain? The lady came in agitated and a little upset. My lecturer, quickly picking up on the fact that she felt upset, warmly smiled and said: ‘a 5-minute hand and arm massage on each side will be lovely’. Within minutes this lovely lady was now sound asleep on the chair, and it was from that moment, I understood how powerful informative and a compassionate touch was and how important complementary therapy could be in providing relief from symptoms of a disease. Dementia is a general umbrella term applied to several conditions that have widespread and permanent impairment on the brain. For massage to have such a powerful impact on a degenerative brain disease can be mind-boggling… so let’s break it down. When a loved one responds positively to massage therapy, whether it’s a hand and arm massage, a shoulder massage or massage of the feet, hormones are released. Hormones such as endorphins and serotonin. These release into the body encouraging feelings of well-being and reducing anxiety and irritability. These hormones also have a significant benefit to improving quality of sleep which is a symptom that many suffer from. These hormones also reduce feelings of isolation and loneliness. Their circulation and lymphatic system are stimulated which improves their immune systems, making them less susceptible to infections. Massage also helps increase spatial awareness and alertness reducing the risk of falling. Their digestive system is stimulated, which improves digestion and makes elimination of waste easier. Importantly, individuals living with dementia don’t lose recognition of a caring touch even at later stages of the disease. Carers are also impacted by the disease. The physical and emotional demands of caring for someone with dementia can be high. As the amount of care that is needed increases, more time and energy is required from the carer. If you are caring for a person with dementia, you need to look after yourself or the demands may wear you down. It is important to take time to look after yourself. This treatment helps in looking after your health so as you can look after theirs. Skilled, compassionate human touch helps ease physical, emotional and psycho-social distress. A hand massage, back massage or simply holding a person has the power to elicit positive, life-affirming feelings and responses. For the person with dementia, touch becomes a language of the human heart and a remembrance of their place in the world. What a very informative blog Kat.